Commenting on blog posts is one of the ways internet marketers recommend to use to get traffic to your website. Unfortunately most of these campaigns are badly executed small business marketing! You will notice that two of the three of these require that a human see your comment and then follow a link back to your site. If you are paying someone who is in another country to post inane comments like “good post” or gibberish that makes no sense, this is just throwing money down the drain. We have a number of clients who spent good money to get “backlinks” this way. Unfortunately when checking the links, most were on “no follow” blogs so they were basically paying for nothing! a value that can be assigned to the rel attribute of an HTML a element to instruct some search engines that a hyperlink should not influence the link target’s ranking in the search engine’s index. What that means for us marketers is that google will not count that as a point in our favor so if we are not going to do commenting the right way our time is wasted! This one works well if you have the time to cruise popular blogs in your industry and are prepared to make insightful comments that ADD the conversation rather than just posting “first” on them. The reason this works well is that comments generally show from first to last and so anyone reading the post will get to see what you wrote and may click the link to get back to your site. The only thing to watch out for on this is one is to make sure you are early or late in the conversation, some popular blogs get HUNDREDS of comments and being in the middle of them will get you no love. This one works well and if used in conjunction with targeting industry leaders can increase both your traffic and networking efforts. So this is how it works, you take someone like Howie Jacobson, adwords genius, who writes a blog and has written a book about how to do adwords correctly. If you are in the online marketing field, he is a great one to comment on because people read his blog AND he answers his own comments. This way you could get a click back while increasing the chances that a big wig in your industry might notice you and possibly recommend you OR comment on YOUR blog! So what is an insightful comment. I can tell you that is not determined by length! Just yesterday I wrote a post about real estate farm marketing (which is picking an area that a realtor would target) and got a really long considered comment about selling farms in the midwest. TOTAL disconnect and I did not approve the comment so that time was wasted for either the person commenting or whoever they hired to do this work. Make sure that you write a couple of sentences that are relevant to the conversation! It is also about content! Here is a comment that came in on that same post, “Thanks for a great post. very informative. I totally agree with you, having is the right mindset is most important of all. I Have already shared this post with a few of my friends and they loved it. Thanks”. NOW, while I have plenty of posts that talk about mindset, this was not one of them. Had they taken two minutes more and found the right post to comment on, I would have approved it even though it was spammy. The grammar mistake was theirs not mine! This one is a little technical and somewhat controversial. 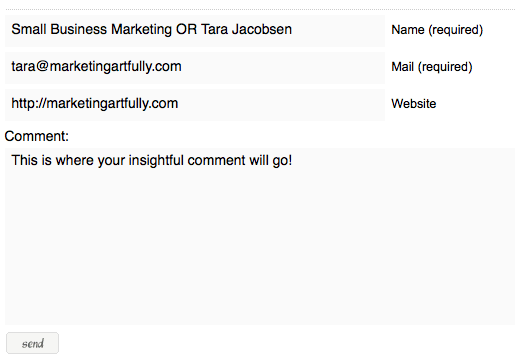 If your whole point of commenting is to get a keyword targeted backlink then you need to use a term like “Small Business Marketing” as your name rather than your REAL name (in this case I would want to use Small Business Marketing INSTEAD of my real name Tara Jacobsen). If I did this on a blog that allowed follows then the google would attribute that keyword back to my blog! Unfortunately most blogs are no follow and additionally, some that are will not post comments from keywords, only people. If you are paying people to post comments, then make sure they are targeting “do follow blogs” and that they are using your keyword targeted names. One of the easiest ways to get labeled a spammer is to post a comment FULL of hyperlinks to your website. If it is an open comment blog it will get posted but it is impolite. 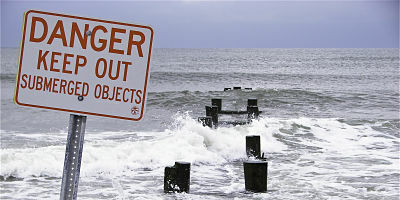 If the blog author monitors their comments then they will, in most cases, not approve the comment. Either way, definitely not a best white-hat marketing practice! I was actually on Linked In (my first introduction to SEO) and came across your profile (you know someone or in a group that I belong to … you know how it is when you click click click) and clicked on this link because I have been blogging and researching SEO simultaneously, and reading up various opinions on SEO and Blogging. After all, what better way to learn about it all except by applying what you learn as you go along. One thing I find interesting is how many experts there are out there. More SEO experts than marketers it would seem these days! I like what guidelines you give and will take heed. I do, however, take time to comment when I read something I like … knowing now how important feedback inspires us to continue. I have to disagree with you on a few points. Mainly the value of blog commenting. The bottom line is, ‘a link, is a link, is a link’. If it’s a ‘no follow’ it will not contribute to the google pagerank, but it’s still a vote in favor of the target site. Even if the anchor text is ‘Amir <-that's my real name', it's still an incoming link. In the grand scheme of things, it's probably worth your while to spend the money you just spent on 'blog spamming', somewhere else. But it does work. By the way, wikipedia is not the end all and be all for information. The fun thing about online marketing and SEO, is that the playing field, as far as search engines algorithms are concerned, changes all the time. As such, it will keep people like you and me in business for a long time. I’m relatively new to blogging (a little over a year) and I started it to have additional information for my students but have been diligently working to find valid information about how to use it as a marketing tool and understanding the importance of comments, etc. what I do is use Google Alerts, as well as HubSpot and also search keywords for the latest trending articles/blogs that people have written about. If and only if there is something I can comment on do I comment. Sometimes I will link back to the web site and other times I just mention the company name and the relative products that relate to the blog post. I do appreciate the tip of not getting the love if I post in the middle of a conversation, but getting the alerts and being plugged in to HubSpots Social Network tool helps to stay on top. @Judy – commenting is great, I comment! Just as a backlink tool is it not so special without having a plan. @Chris – I am going to have to check out this HubSpot social networking tool thingy…anything that makes keeping track is okay with me!!! While I had no clue that I should have been linking to websites by using the keyword that I would like to rank for instead of my name, I have been posting comments as a backlinking technique for awhile now, who would’ve known? (Just when I thought I was a SEO pro). I do agree with Amir that a link is a link is a link though, get them whenever and wherever you can. Christian – Some sites will let you list yourself as a keyword and some will automatically disapprove your comment if you are not a human! BUT that having been said, you are doing a bunch of things right! You have gone to gravatar and gotten a picture associated with your email address which makes me think you are real. The article on your site is well thought out and in actual english (not something you see everywhere these days!) Thank you so much for reading and commenting!!! The information that you have provided about how to commenting on popular blog is very usefull for each one who is comment on blogs including me also nice post .Thanks. Ya know I never thought of getting first on the list of comments or at the end. But it does make sence to me if your looking to drive traffic instead of just get backlinks…. great tip!! @ James – that having been said, saying “first” with no thoughtful comment is worse (in my opinion) than saying nothing at all. There are hoards of commenting dorks out there who think shouting first will accomplish fabulous effects. I would rather be third with the first good, thoughtful comment. Thanks for reading!!! Great article here! I am definitely going to surf around your blog and see what else you have that could be helpful to me! So, ironically, I am going to comment on a blog post about that very subject. I agree that paying someone to comment for you or providing low quality comments yourself is a big no-no and is dumb to do. However, providing a real comment yourself relevant to the post can still be a great way to engage with other bloggers in your niche, make some friends or potential business partners, get some traffic and links, etc… You just have to do it legitimately and not in a “spammy” sort of way. I too would have to agree with Amir. If you have something to contribute to the conversation you may as well leave a comment, the link is simply the thank you for adding to the hosting site. That said I have a site that is bombarded by spam constantly and it is a bit annoying. The upside is that automated blasts can always be easily identified. Blog commenting is an awesome way to grow your profile and get back links to your website – but it’s important to make sure you’re actually contributing something to the conversation instead of just dropping a link. Good thoughts here. The direct-mail is necessary for any kind of business. The deals and the business marketing totally depend on complete direct mail solutions. If you are a business blog owner, chances are that you already know how difficult it is when you go mainstream. It’s a big competition out there and no one is spared whether you are a tiny small business owner or a giant conglomerate. It’s very easy to weed out anyone those who are just after spamming your sites. Give chance to the rightful ones. When it comes to SEO ranking we all know that the SEO Panda update has made a huge impact in turning down sites who were on top. Blog commenting is a good way of building quality links instead of using automated software. And I see that you got a good solid keyword backlink with this comment…:) I don’t always approve ones that have a keyword name but your comment was good and to the point. Additionally, it had keywords that will be shown with this post and which will help increase the rank for me. Something commenters don’t always think about but which can tip the scales from a “trash” to and “approve”! I learn tons as I read posts that are relevant to what I do. There are so many great, smart writers that I wouldn’t know about if I wasn’t looking for a place to drop a link!!!! LOL I don’t always have much time to browse and read, so being able to comment and get a link in the process is my incentive to do it. Hey! I’m just new here and starting to learn about commenting on blogs, thankful i read this post from you Tara.. Im very confident now of what to do so that we can have more backlinks and traffic for our site.. This is Great! Blog commenting has become a very unruly activity. More commenters need to learn the basics and the etiquette as you have laid it out here. The worst yet – our QuickBooks accounting bookkeeping site is now bombarded with ‘phony trackbacks and faux pings – the most deceitful link-spam tactic yet. I suspect that many new bloggers and WordPress owners are being taken in on this. Thanks for the primer, Tara! Haha great post. I saw that this was related to leaving blog comments, so I had to leave one on here. Very good overview, and I hate all the comments I get on my sites too. I have done a a ton of work on Blog posting and all I can say is if you feel like you can add value to the blog and it will help others post. If not dot waste your time. Good quality links are both follow and no follow and as long as your adding value you will get the juice. Highly valuable information.there are some of website which describe a single marketing tool in detail. Thanks.Tara would like to add more in your article that relevancy in blog comments is very important. Comments will be not relevant to the information which is being discussed then we can get the desired result from blog comments..Bundle of thanks.. I learned about blog post to rank your site higher from Ryan Deiss. He had a free eBook called Authority Codes and I refer to it anytime I want to rank a new site that I’ve put up. As a matter of fact I’m using that method right now. I always make sure I leave a relevant comment so my comment will get approved. Thanks Tara. Spam posts drive me crazy. Many don’t even have anything relative to my sites. Poor English is another giveaway. I had to close one blog to comments because I was spending too much time moderating spam posts. Akismet helps a lot. I think what you are using with the captcha code would help to keep out the bots. Thanks for a great post. I have a pretty high tolerance for comments as long as they are relevant and are written well. One thing that I like about how you did your name is that you have your “name” and then the keyword targeted link. Sometimes I feel funny talking back to someone who only uses the keywords…:) Thanks for the great comment! I have been using blog commenting for about a year as the dominant method to get backlinks and most of those links are “nofollow”. I can tell you that those nofollow links show up in my Google Webmaster Tools reported metrics. I can also tell you that my site is PR 2 and my backlink building activity continues with the addition of article marketing. I have read your post! I would love to try some of your ideas in business marketing. Thank you so much for this wonderful blog.